Looking for your first job outside of school can be stressful. Employers want you to have years of experience for an entry-level job, but you need the entry-level job to get the experience. It seems like a lose-lose situation. Luckily, things aren’t as hopeless as they might seem. Even if you haven’t had a chance to work in your field yet, it doesn’t mean you don’t have useful experience. It just means you need to learn how to leverage it. Just because you haven’t had a chance to work in your field yet, it doesn’t mean you haven’t cultivated any important skills. Typically, your schooling will have prepared you for the field you want to enter through in-class projects and activities. If you did well on a certain project, you can use this experience during an interview. Don’t forget to mention any relevant projects you might have done outside of school too! Extra-Curriculars. 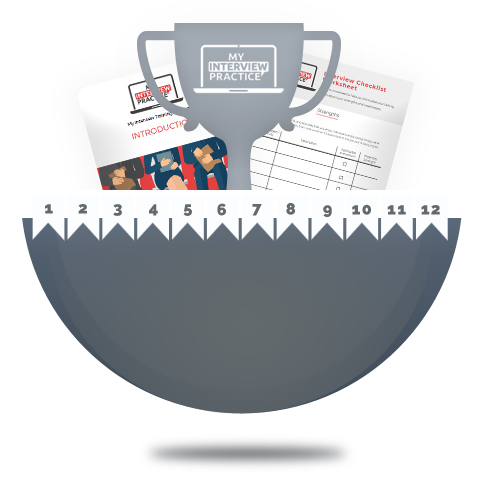 If you were the captain of your sail team or won the MVP award in your soccer league, mention it! While your extra-curricular activities might not be directly related to your job field, they still give employers an idea of your important qualities such as how you work with others, your leadership abilities, and your work ethic. Academic GPA. When you don’t have any experience, your academic GPA can be a very important factor in whether or not the interviewer decides to take a chance on hiring you. Be sure to tell them about your GPA as well as any academic awards or honors you might have achieved. Once you have a good grasp on what makes you an appealing candidate, you can then move on to the next part of preparing for an interview: the questions. Answering questions during an interview can seem nerve-wracking. You’re in an unfamiliar situation, unsure if you have the right answers for an interviewer, and hoping you get the job. Luckily, interviewers tend to stick to a similar group of questions when interviewing students, so you can easily prepare yourself. We’ve gathered up some of the most common interview questions you’ll encounter and some effective ways you can answer them below! Students’ lives are in a constant state of change and employers know this. The purpose of this question is for them to find out whether you plan to stay with the company long enough for them to get a return on their investment in you. Understandably, you might be unsure of your plans for the next five years. If that’s the case, don’t panic! Answer honestly, but keep things as vague as possible. Take a look at the sample answer below. This is a good answer for those of you who are unsure about where you will be in five years. This answer tells the interviewer that you are interested in the company and want to stick with your field without outright saying you’re not sure if you want to stay with that company long-term. On the other hand, if you know for a fact that this is the company you want to work for, let them know! They’ll appreciate it and count it as a point in your favor. Peer-to-peer interactions are an important part of any job and can make or break a workplace. Interviewers ask this question so they can get an idea of how well you work with others and whether you’ll be an asset or a handicap to their team. When answering this question, you want to focus on positive group efforts, especially ones where you took on a leadership role or were a significant member of the team. Take a look at the sample answer below. Collaboration, time management, and communication skills are three of the most important qualities interviewers look for in students with little to no work experience. Emphasize how you exhibit these qualities, and you’re sure to make a good impression, no matter your field. Apart from asking about your past school experience, your interviewer will want to know how you’ll behave in the workplace, specifically in regard to how you will react to an inevitable time management conflict. The important thing is to not be afraid to tell them that you’ll ask for help. Employers want competent employees who can handle their own problems, but they also want team players who know their limits. A good way to answer a question like this is to incorporate examples from the past to show that you know how to react under pressure. That is a good answer because it shows you can prioritize tasks, an important skill that interviewers look for. In addition, it shows you can bring your peers together to work toward a common goal, another crucial aspect of time management. This is an open-ended question that gives you a great opportunity to set yourself apart from other candidates. You can choose from any experience in your life, but it’s important to use one that will impress the interviewer. When deciding on an accomplishment, it’s always a good idea to mention something that benefited as many people as possible. This will give the interviewer the sense that you are a team player and have the ability to make a difference in others’ lives as well as your own. You have a valuable skill set. You possess desirable soft skills. That is a good answer for several reasons, the first being that you’re communicating your love for the company. This lets the interviewer know that you are personally invested and motivated by passion rather than money. It also shows that you took the time to research the head of the company and his work, showing even more devotion to them and what they do. When it comes to interviewing, there are ways for even the most inexperienced student to land a job in their field. It’s all a matter of showing up well prepared. Take the time to create your answers to these common student interview questions, and you’ll be one step closer to landing your first job! Want to get in some practice? Use our Interview Simulator to take full length mock interviews with questions tailored to your specific qualifications! Receive a summarized version of our exclusive training program, tips and other interviewing insights for free. 12 step by step Guides & Worksheets that help you gain interview confidence. Understand what employers look for in a perfect candidate and how you can use this program to land your dream job. Learn what to research about a company, why it’s important, and how to use that information to gain an edge over the competition. Keep track of your research with this step-by-step worksheet that helps you capture important company information as you go. Determine how to accurately assess your strengths and weaknesses and use them to your advantage during an interview. Don’t know what your top strengths and weaknesses are? This worksheet will help you identify them and then use them to formulate your talking points. Understand why interviewers ask Behavioral and Situational questions, then learn how to use the S.T.A.R. technique to blow them out of the water! 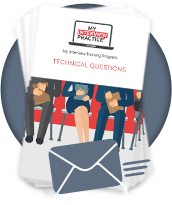 Technical questions are an important part of the interview process. Understand why they are asked and how best to answer these questions. The questions you ask are almost as important as the answers you give during an interview. Determine which questions to ask and why they’re important. Knowing what to do before and after an interview is crucial. Use this checklist to help get you into the right mindset for the big day!